A Spanish doctor has been sentenced to a year in prison, for his role in the death of the former first-lady of Nigeria, Stella Obasanjo. 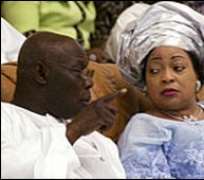 The wife of Olusegun Obasanjo had visited a clinic in Marbella in October 2005 to undergo cosmetic surgery. She underwent liposuction to reduce the size of her abdomen, but left the operating theatre with fatal injuries. The judges said the surgeon had shown carelessness and neglect. Mrs Obasanjo, 59, came to Spain in October 2005, checking in at the Molding Clinic - a discreet and luxury facility, specialising in cosmetic surgery. The court heard that a tube used for removing fat had been placed by mistake into the patient's abdominal cavity - puncturing her colon and lacerating her liver. Mrs Obasanjo became seriously ill the following day. But prosecutors said the surgeon initially failed to answer his mobile phone, and then waited more than four hours before driving the patient in his own car to an intensive care unit, where she died an hour later. The doctor - identified in court documents only by the initials AM - was sentenced to a year's imprisonment for causing homicide through negligence. He was disqualified from practising medicine for three years, and ordered to pay $176,000 (£108,000) in compensation to Mrs Obasanjo's son. The court said simple blood tests or an ultrasound procedure would have detected the internal injuries - which, with more time, could have been treated.